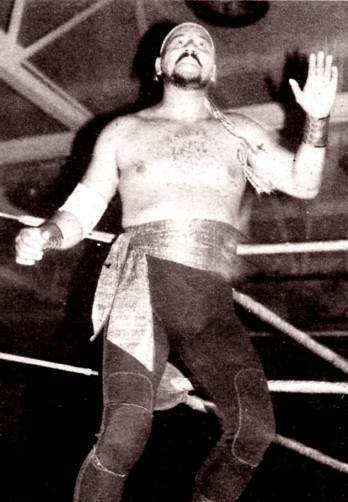 Home / Professional Wrestler Profiles / J / Jose Estrada Sr.
April 21, 1980–WWF: Greg Gagne defeated Jose Estrada at Madison Square Garden in New York City..
Jose Estrada Sr. was one half of the famous Conquistadors tag team with Luis Rivera in the World Wrestling Federation..
July 16 2005–WWC Bruiser Brody Memorial: Jose Estrada Sr defeated Carlos Colon in a Legends Match..
Maria wrote: Jose Estrada is my brother, it’s great to see that wrestling has not died and fans still believe in the heros. As for me, well… I can tell you great stories how it all began … In Brooklyn Bronzevill Recreation Center .. there is where the greats!!! came from. I met Andrea the Giant, Bruno SanMartino and the rest all struggle to get a little piece of the American dream and their ticket out of the Ghettos. I remember as a little girl, going to the center and watching my brother wrestle, I got to hold the belt and the cape, yes, he was a tag team back in the day with my cousin, they were vampires. Then on to Madison Square Garden, it was then I got to meet the Greats!!!! the rest is history…. Do yourself a favor and go back in history, and find out where it all began,,,, you will see my story is true.. and there’s so much more to tell … so how much of a fan are you really, Tito Santana came way after… and he and my bother are great friends. Lets move ahead 30 years and now meet my nephew “Rico Suave” in PR wrestling one of (Jose Estrada’s) son. have I got your attention yet. I was just reminiscing.. thanks for creating a web site.